I’ve posted this cake before when I first found the recipe on Orangette but I made it again this weekend and tweaked the recipe a bit so its now officially a part of the family. It’s still very young in cake years and it doesnt come with its own memory yet but hopefully one day I’ll be able to make it enough times and pass it to someone else in my family and it will remind them of something good and make them smile. 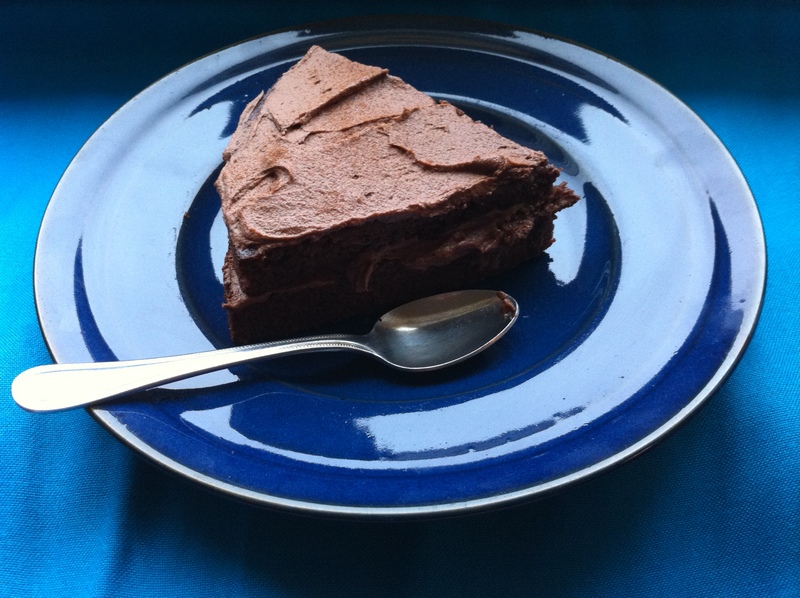 In the meantime, its just such a good chocolate cake recipe and I’ve got the quantities and weights right for one sensibly sized cake now (not that anyone is complaining about the surplus of cake batter)… so its worth sharing the love. I’m not blowing my own horn. 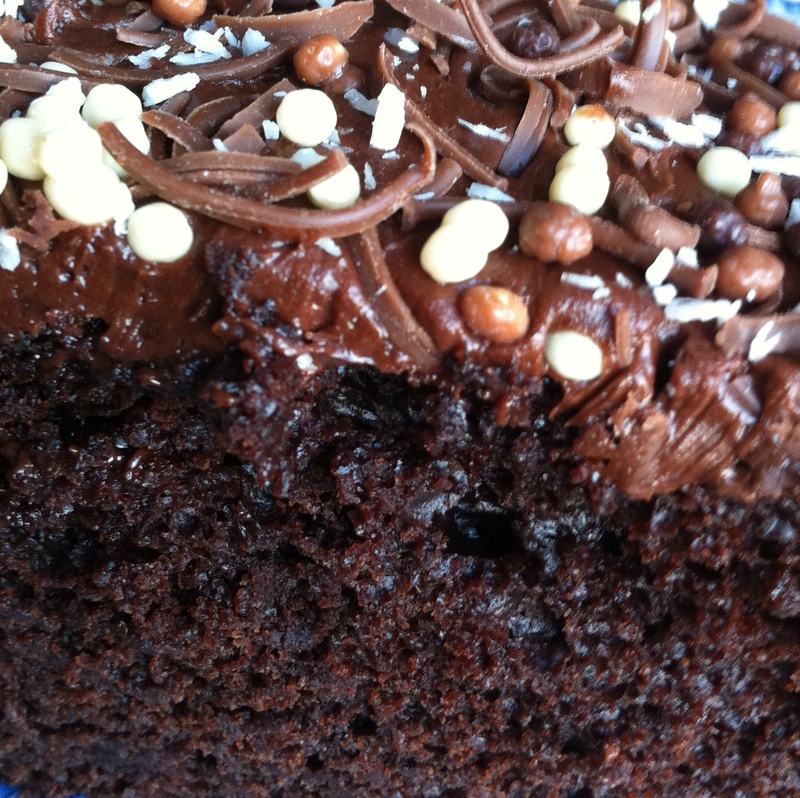 It’s earned the title of the perfect cake because it’s every thing I think of when I think chocolate cake. Rich and dense… but in a good way. You can eat it just on its own with a dusting of icing sugar or topped with chocolate butter cream and some fresh fruit like I did this time. Preheat the oven to 150°C. Line and butter a 20(ish) cm spring form cake tin. Break the chocolate in a bowl, pour over the hot coffee and stir until the chocolate is melted. In a separate bowl sift together the flour, cocoa, bicarb, baking powder, sugar and salt. Beat the eggs in a stand mixer until foamy and pale and then beat in the butter, vanilla, buttermilk and coffee mixture. Slowly beat in the flour mixture until just combined and then pour into the cake tin. Bake for 50-70 min until a skewer inserted comes out clean. Cool in the tin for 5-10 min and then turn out to cool on a wire rack before icing and topping with fruit. 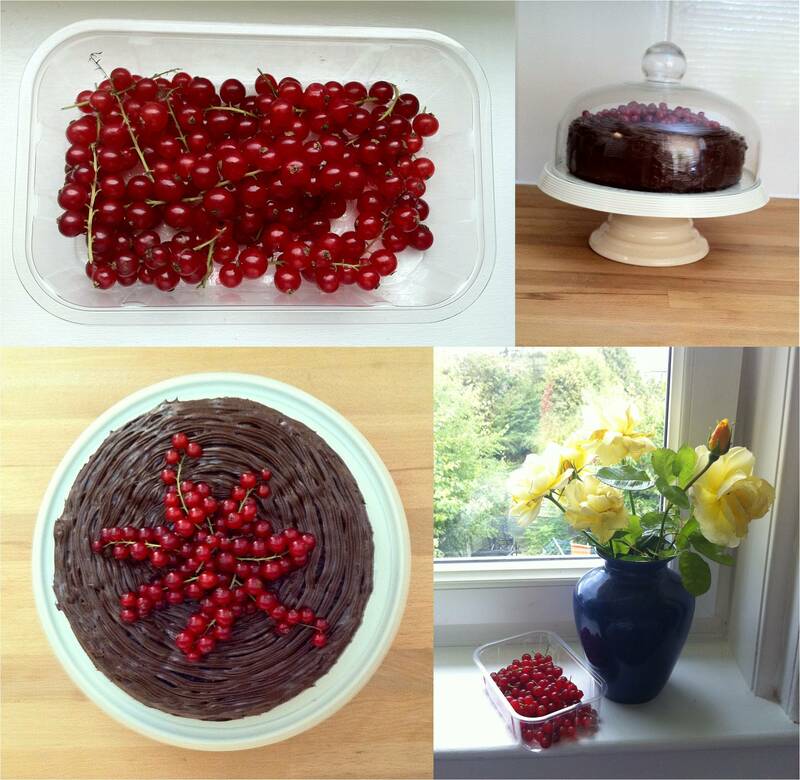 Red currants are good for this because they dont wilt after more than a couple of hours out of the fridge. 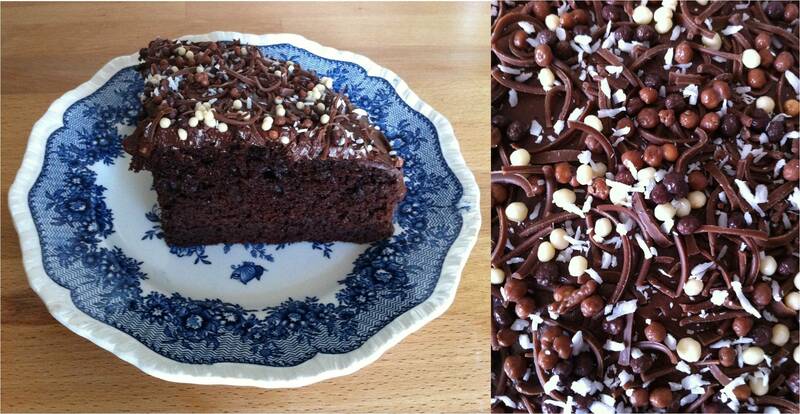 There are a few recipes which I’m constantly on a quest to perfect and chocolate cake is one of them. Cake is one of those things you need several people around to eat before you bake it otherwise you suddenly find that you’re sitting in front of an empty cake box with a guilty conscience and a stomach somewhat resembling the curvature of the earth. So if I find a chance to try a new recipe without risking afore mentioned solo binge session, I grab it… queue Mother’s Day. This recipe was on my ‘to bake’ list although I cant recall when and where I discovered it and I had a surrogate mother in the vicinity to force it on so that was all the excuse I needed. I’m not going to ramble on with multiple superlatives to express how good it is but lets just say the title of this post would be the same had I baked it for any other occasion. 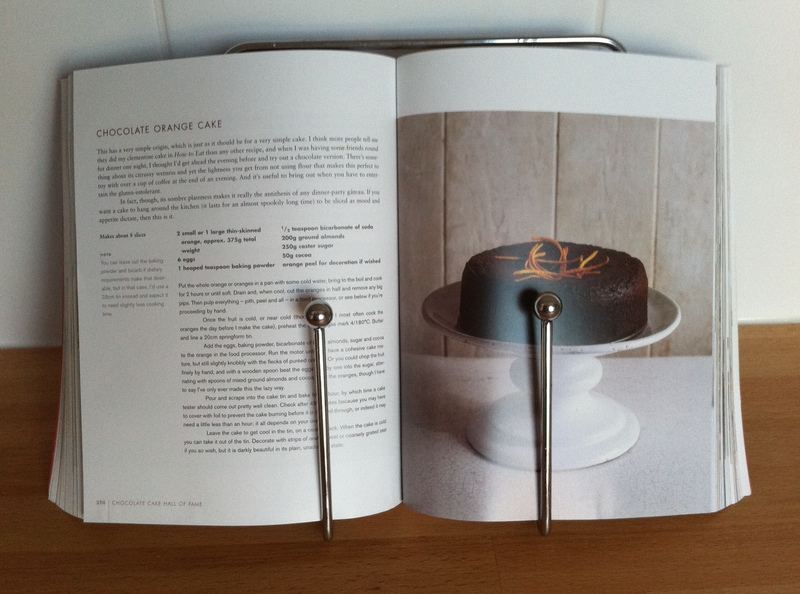 Despite a whole section on chocolate cakes in my copy of Nigella’s Feast this one is now officially my go to cake (sorry Nigella, you win some, you lose some…and some get rained out). The recipe is from Orangette (who happens to be my favourite food blogger for her style of writing) who in turn adapted it from Epicurious. I felt no need to tweak it any further and having successfully executed it with no complaints from the family members on who it was thrust, I think it can be described as perfect just as it is. I did cheat in one respect by using a tub of Betty Crocker Chocolate Buttercream Style Icing (the link is to show what you’re looking for by the way, its easy to find in supermarkets)… not because of any fear of making the ganache but because I had just discovered it and was dying to see if it was as good on a cake as it was scooped straight out of the tub on a (clean!) finger. 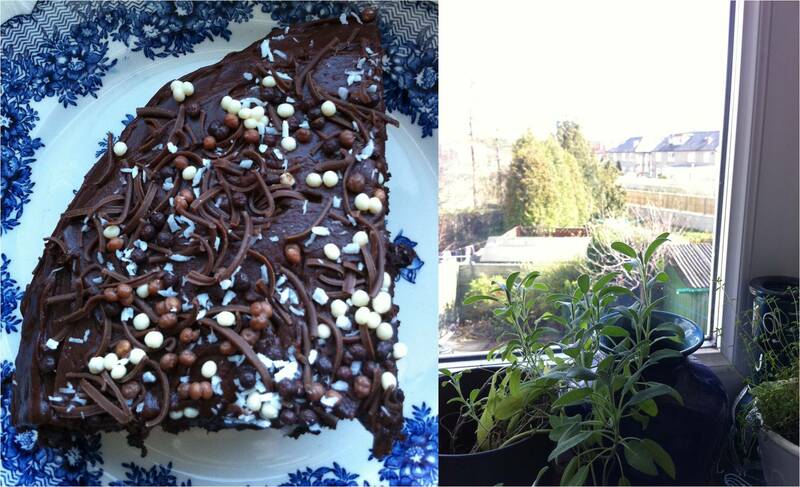 Turns out the answer is yes, and its more chocolatey than sugary so its not as sickening as home made buttercream. I should point out that I was introduced to this delicacy by my previously-mentioned-baking-friend-Dawn who’s culinary skills are superior enough not to call for shop bought icing unless its just as good as the real deal. Do not feel ashamed. 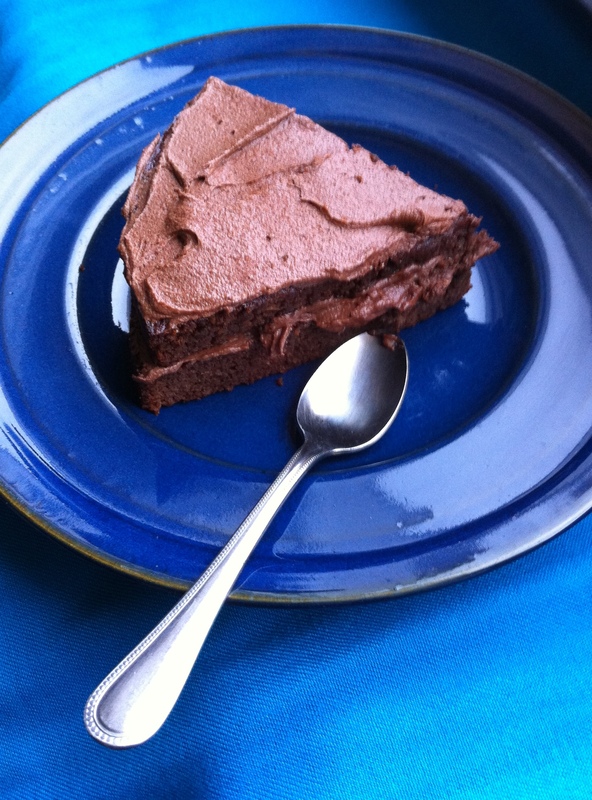 Its too late to use your mother as an excuse to make it (for those of us in the UK anyway) but if its chocolate cake you are after, then it’s this chocolate cake you should have. p.s. In case you’re wondering why my cake tin is featured upside down in these pictures, this is my trick for getting your cake into a tin without leaving icing all over your hands (not necessarily a bad thing I know) and the sides of the tin (has less benefits) every time you go to steal a slice. If you put the cooled cake straight on to the upside down lid you can ice it in situ and put the tin itself straight on as the lid. Et voilà! There’s nothing more satisfying than an excellent food experience when you least expect to have one… I’m getting ahead of myself though. I have so much to write about the weekend that I almost don’t know where to start. 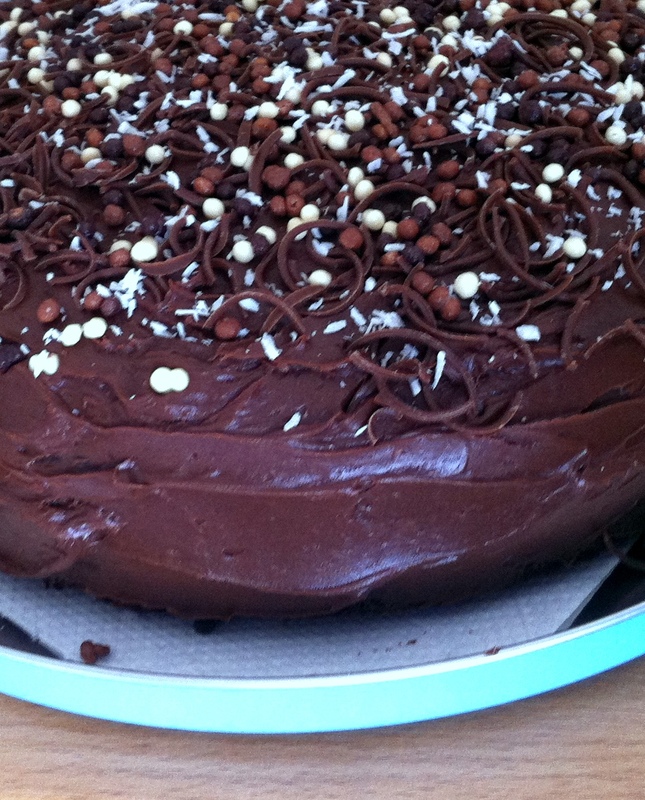 Let’s start, as one always should, with cake. The road to this cake started out with a speed bump or two. In fact, less speed bump, more ten car pile up. I have been dying to try out one of Nigella’s “chocolate cake hall of fame” recipes since I took ownership of her book Feast (the source of inspiration for the winter spice muffins in my last post). So when my other half expressed a cake craving I forbade him from buying anything off the shelf and promised to make him something better. I got home, only to discover I was missing key ingredients for the flour-less chocolate orange cake I had set my sites on. Given I had promised I would deliver chocolate wonders and it was howling a gale and pouring with rain outside ( yes, again), I decided to make do instead of going out again and try the honey chocolate cake for which I had all the bits and pieces. I knew it probably wasn’t going to turn out as planned when I combined everything and it was closer to chocolate soup than cake batter. Not to be defeated though and ever trusting in Ms Lawson’s foolproof recipes, I poured it into the tin which then started to leak chocolate all over the kitchen. Still hoping to salvage it, I placed the tin on some baking paper in a roasting tray and quickly put it in the oven in the hope it would cook before the whole cake landed up in the tray. It turns out the tray trick works but the cake batter was past hope. After 2 hours in the oven it was obvious a skewer was never going to come out without being covered in a clump of goo, never mind clean. 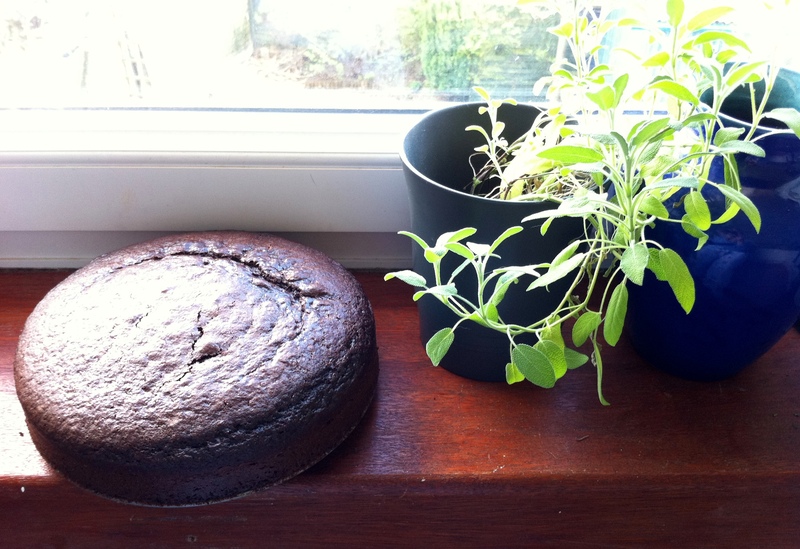 So I admitted defeat, although we still picked off all the cakey-ish cooked bits round the edge which eaten warm, made a just-about-acceptable chocolate cake fix. I’m not one to accept defeat but I couldnt work out what had gone wrong with the first batter so this weekend I decided to try again with the chocolate orange cake I had planned to make in the beginning. You start by boiling whole oranges for 2 hours, blitzing to a pulp and then combining with the other ingredients in a blender once cool. It couldn’t be simpler but not content with disaster number one, I managed to put the oranges on and forget about them for a few hours so that the pot boiled dry and luckily didn’t burn my new kitchen to the ground before Ross mentioned the odd burnt orange smell emanating from the stove top. Thankfully the crisis was averted (oven cleaner works wonders on burnt pots as long you clean them well afterwards by the way) and I managed to salvage the oranges and finally produce something that could be considered a proper cake – a dense, damp chocolate crumb full of sweet citrus undertones. Although according to Ross, it’s not cake if it doesn’t have any icing so I had to whip up some chocolate orange and cinnamon butter cream to top it off as Nigella’s recipe was for an unadorned version. By the time I was finished I could only manage one slice (I still haven’t learned to heed my own health warnings about ingesting significant amounts of icing during the baking process) but according to the family guinea pigs the recipe was a success and with all the orange and cinnamon it’s suitably festive for this time of year! 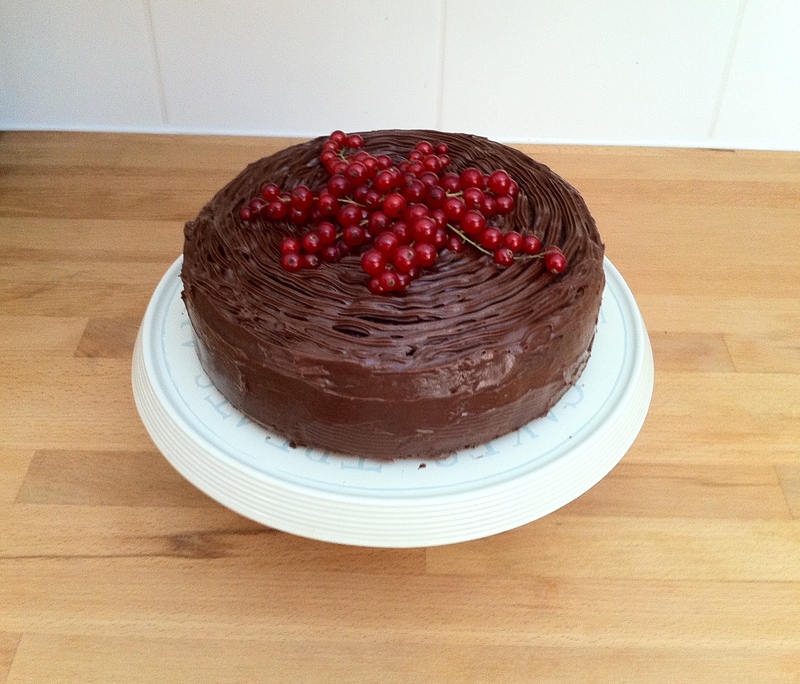 So if you’re looking for a very simple chocolate cake that keeps well (I’m trusting Nigella on this as this one didn’t last long enough to prove the theory) then as long as you keep an eye on the oranges, this one couldn’t be easier! On Saturday we decided to get out of the house and go window shopping in Morningside again. Before I go any further I have to mention the Cheesemonger we discovered and the little veg shop next door. I wandered into the Cheesemonger and was immediately greeted by a serious pong and a whole hoard of cheeses from all over the world. Once I had managed to take it all in I chose a wedge of Tallegio and then, noticing my overwhelmed expression, the helpful staff reccommended I try the Prima Donna. Well lets just say there’s a sizable chunk taking up all the space in my cheese drawer. I would definitely reccommend you go past if you are in the area and ask the guys behind the counter to help you pick something new to try (IJ Mellis – check out their website for info). I plan to go back every week until I’ve worked my way along the counter from left to right. 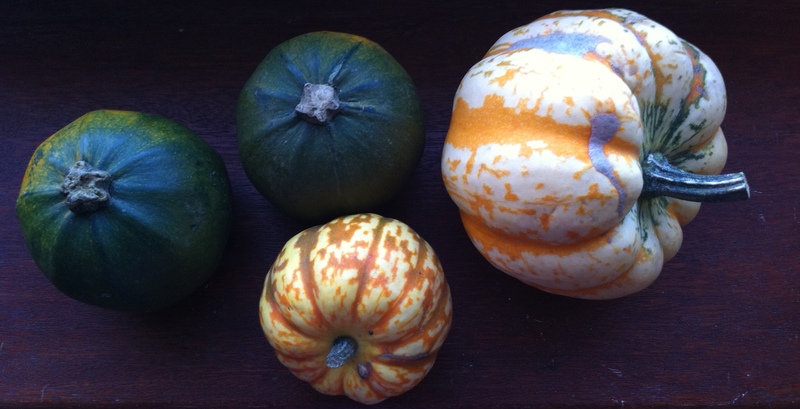 On the way out the door I stumbled across these beautiful squashes in the neighbouring convenience shop, which have already been roasted and devoured with a honey ginger pork fillet (I’ll have to post that recipe some time as well). It was positively glacial outside so after putting our spoils in the car and a brisk walk up the road we agreed it was time to stop somewhere cozy for lunch. Most of the trendy coffee shops were packed to the rafters with shoppers who clearly had the same idea as us and we were about to press on up the road in the hope of finding something at the other end when we passed an Indian with a 5.95 lunch special and plenty of spare tables. Normally empty tables aren’t a good sign but since we were bone cold and ravenous and it looked all snug and welcoming inside, we thought why not? Well I wouldn’t normally have thought to have an Indian meal for a Saturday lunch but I think I’ll be making it a regular occurrence from now on, especially over the winter months. The name of the little restaurant we had landed up in was The Clay Oven and they definitely know how to cook. The lunch special consisted of a sabzi pakora starter, a handful of curry options and your choice of tea/coffee or ice cream to finish. It might not sound very out of the ordinary but the food was so delicious that it didn’t need any fancy frills or modern twists. The onion and vegetable pakora was perfectly crunchy and spicy and perfectly balanced by their tomato ‘special’ sauce (I remembered to take a picture just in time – the poor quality is testament to the hurry I was in to get back to eating). For my main I chose the sweet and sour Pathia curry which I hadn’t tried before and can safely say is going to be my number one choice from now on whenever its on a menu (by this point photos were the last thing on my mind). After mopping that up with a fluffy naan bread the size of my head, we waddled back out on to the street with satisfied grins and slightly rounder profiles, not to mention much warmer tummies. The cake recipe belongs to Nigella Lawson and the butter cream is my own concoction. Put the whole oranges in a pan with cold water, bring to the boil and cook for 2 hours, or until soft. Drain and when cool, halve the orange and remove any big pips. Pulp everything in a food processor. Preheat the oven to 180°C and butter and line a 20cm spring form cake tin. Add the eggs, baking powder, sugar, bicarbonate, almonds and cocoa to the orange in the processor. Run until you have a cohesive cake mixture. Pour and scrape into the cake tin and bake for 1 hour. Cool the cake on a rack while you make the icing. Cream the sugar and butter together and mix in the melted chocolate, cinnamon and orange zest. Add the orange juice a little at a time until the icing is the right consistency. Cut the cake in half and spread both halves with icing. Put back together and serve!